From displays of political brilliance to the darkest days of personal turmoil, Bill Clinton's presidency was as controversial as it was colourful. This four-part series explores his turbulent time in office, looking back over key domestic and foreign policy decisions and analysing his contribution to modern international politics. 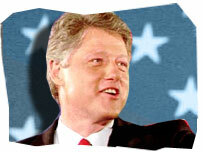 When William Jefferson Clinton was elected President of the United States on 3 November 1992, hope was in the air. But the honeymoon did not last long. By February 1993, President Clinton had registered the lowest approval ratings at such an early stage of a presidency since polling began. Yet it would prove to be at such moments of adversity that his political skills were at their greatest.